Cox Digital Telephone® provides crystal-clear, reliable calling and over ten of the top phone features. All Cox Digital Telephone customers can enjoy unlimited local calling and have peace of mind with e911, which allows emergency responders to pinpoint your exact location when you dial 911. A new home voice service is here! Enjoy all the advanced features you want including High Definition sound, the ability to set up incoming home phone calls to also ring on your cell phone or office phone, and now you can block annoying robocalls. As always, enjoy unlimited calling in the US, Canada, and Mexico. If you're looking for the best home phone company, check out all our features that make Cox Digital Phone better than your old landline phone. See the name and number for an incoming call if you have a display telephone or an add-on display unit. See the name and number of the person calling you from the comfort of your couch. Easily call back the last person who called you, whether or not you answered the call. If the line is busy or there is no answer, the phone will continue trying to call back for up to 30 minutes. When you hear a busy signal, you can activate Busy Line Redial to monitor the line for 30 minutes, freeing you up for other activities. When the line is no longer busy, you’ll receive a special callback ring that you can either answer or ignore. Talk to two different people at the same time to conveniently share news or make plans. Block callers who hide their caller ID information. These callers will hear an automated message that says you're not accepting blocked calls. Forward all incoming calls to another phone. 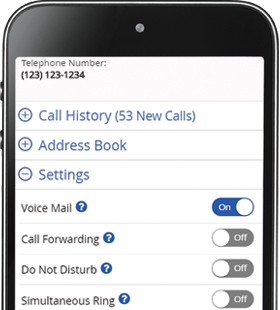 After you activate the feature in Phone Tools, you can designate the phone number where you’d like calls to be forwarded either in Phone Tools or using your home phone. See the name and number for an incoming call when you’re already on the phone with someone else. This feature requires a display telephone or an add-on display unit. Forward calls from select callers to another phone. Automatically reject calls from select callers. Add up to eight phone numbers to your one-digit speed dial, so you can make calls faster without having to remember any numbers. e911 is an enhanced version of 911 services. In an emergency, the e911 service automatically sends your home address and phone number to the nearest Public Safety Answering Point. 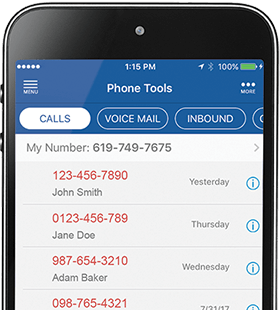 With voice mail, your contacts can leave you a message when you're busy or away from home. 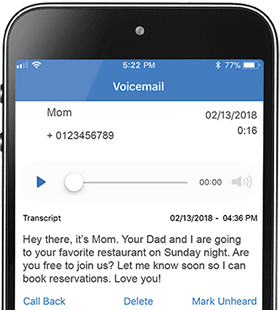 It’s easy to retrieve audio messages and text transcriptions on your home phone or from anywhere with a computer, laptop, or mobile device. Unlimited calling to the U.S., Canada, and home phones in Mexico. Check out all of the features Cox Voice has to offer. Enjoy a higher sound quality than standard calls, so it sounds like you’re having a conversation with someone in the same room, instead of across the country. Automatically block phone calls that use computerized, auto-dialed or pre-recorded messages. To use this feature, sign up for Nomorobo for free at https://www.nomorobo.com/signup and choose Cox as your carrier. Program up to four phones to ring when your home phone rings, so you can answer home phone calls from your cell phone, office phone, or any other phone. 4. Add up to 3 phone numbers and click "Save"
Wherever you go, the Cox Voice Everywhere app is ready to bring the capabilities your home phone service along with you. Whether you’re making or taking calls or managing your home voice mails, your smartphone is now your key to taking your Cox home phone service everywhere. Add up to thirty phone numbers to your two-digit speed dial, so you can make calls faster without having to remember any numbers. If someone calls you while you’re already on the phone, you’ll hear a special tone that you can either ignore or answer, which places the original call on hold. Caller ID Per Call Blocking prevents your name and number from being displayed on a per call basis. Sign in to Voice Tools on cox.com using your My Account login.